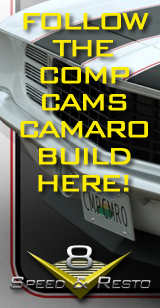 In this installment, we’re driving the 1969 Camaro called “Lou’s Change” built in the V8 Speed & Resto Shop. The car is finished, and the 700+ horsepower supercharged GM LSA 6.2 V8 pulls hard through a Tremec T56 Magnum transmission from Modern Driveline. It handles the road with confidence thanks to a Detroit Speed hydroformed front subframe and suspension and a Detroit Speed QUADRAlink rear suspension and Currie 9+ rear axle. The MagnaFlow pipes sing at RPM, and the modified body includes modern ZL-1 Camaro blended with a classic 1969 Camaro look. Forgeline wheels wrapped in Toyo tires provide traction, and Wilwood brakes bring it all to a stop. OER restoration parts provide a fresh appearance. 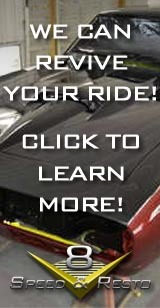 Contact the V8 Speed & Resto Shop about your dream car today!